Beverley’s fine Town Cross was built in 1714, the year the first of the Hanoverians came to the throne. Strange, therefore, that Beverley was the only place in Britain to celebrate the coming of the first King George who, not being able to speak English, hastened the formation of our present democracy in Britain. Most see it as the result of the 17th-century Civil War and the constraints imposed on Charles II when he came to the throne in 1660; others declare modern democracy in the British Isles followed Henry VIII’s dissolution of the Monasteries in the 1530s, when a whole new generation of entrepreneurs grabbed monastic property at knock-down prices. They became Shakespeare’s new and thrusting gentry contrasting, in his History plays, with the old nobility. They took stones from the ‘bare ruined choirs where late the sweet birds sang’ to build their country houses. I stray from the Georgians. 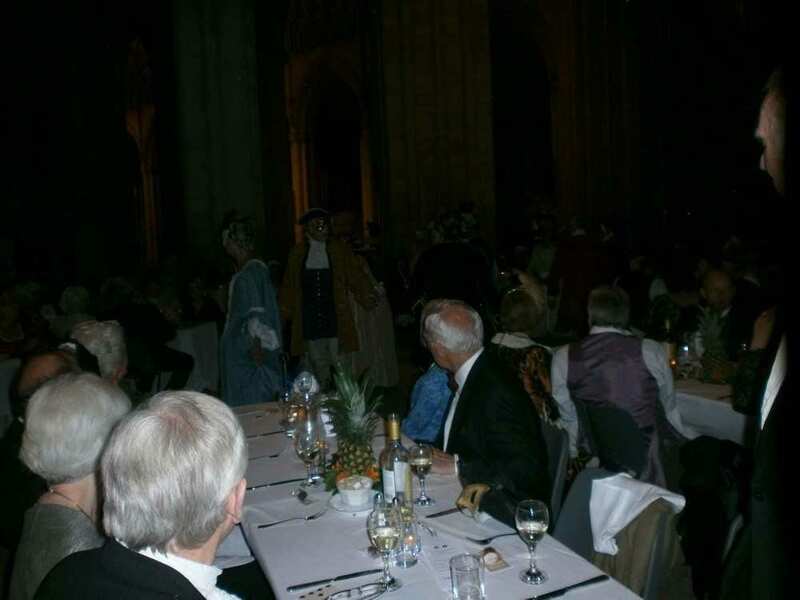 We have been celebrating them here in Beverley with a magnificent array of events from concerts of Georgian music, parades of Georgian costume, tours of the Georgian additions to our Gothic Minster (by John) and so much else. So popular were the visits to Georgian private houses, open especially for the occasion, that there were long queues outside them. And it didn’t rain. 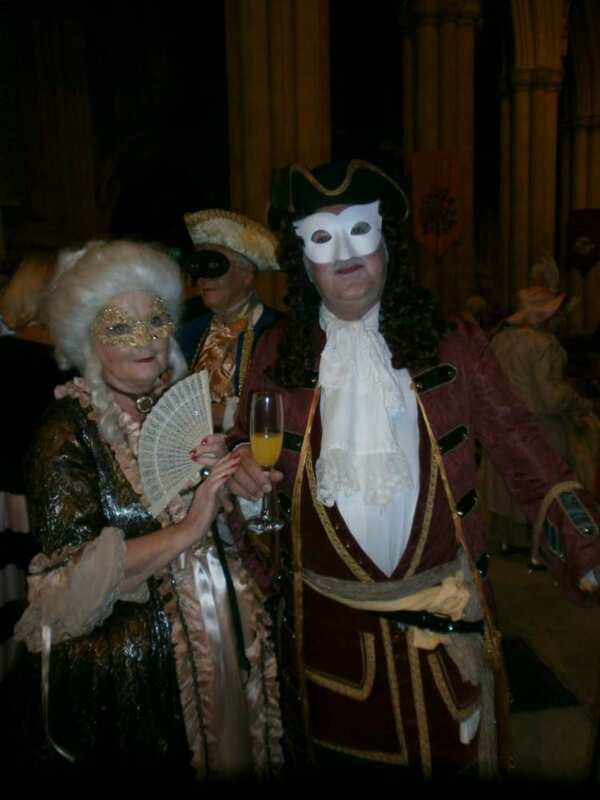 We returned from Italy in the middle of it all and, shock horror, hadn’t bought tickets for the Masked Ball in the Minster. At the talk on Mary Wollstonecraft (Mary Shelley’s mother, who spent some time in Beverley), we were offered two tickets returned by a couple who had suddenly been taken ill. Our luck was in! The setting sun shone on the masquers entering through the grand west door of the Minster, already in playful mood. Nearly all were in evening dress, and almost one third in full blown Georgian outfits: wig and gaiters (I think) for the gentlemen, elaborate hairstyles and crinolines for the ladies. Rumour had it that many had made a special journey to York, which has the best costume hire shop, for their magnificent outfits. They set the scene. We were met at the start of the nave with champagne and a plethora of masks, some painted on, others stuck or tied and some, like mine, held. Was that why so many came up to talk to me, and as they knew who I was and I couldn’t ask who they were! That was the whole point. I had the curious sensation of talking to a number of lively men who were quite familiar, though I had no idea who exactly they were! Our Member of Parliament engaged me in a long conversation from behind his hand held mask, so his identity was evident. Also in the crowd was his finely apparelled female opponent – the elections are next May – though I didn’t see them talking to each other. on the table of Beverley’s mayor who was wearing his chain of office over his 18th-century costume. Then came the Georgian dinner: pea green soup with almond cream, if wanted. Then two cuts of meat with a pagoda-like vol-au-vent topping some creamy concoction, coleslaw, and another vegetable which I can’t recall – probably green. (There was only one menu at the end of the table; I should have taken it back with me.) We shared two bottles of red wine with the Mayor and his wife. Then came a smooth and delicious syllabub for desert followed by coffee and a Georgian chocolate – much marzipan. Between each course Georgian dancers performed with the most elegant bobs and jumps I’ve seen, inviting us all to join in at the end. The wine helped the merry confusion until the church clock struck eleven. The carriages – real or imagined – arrived promptly at the north entrance and the Georgian revel ended.